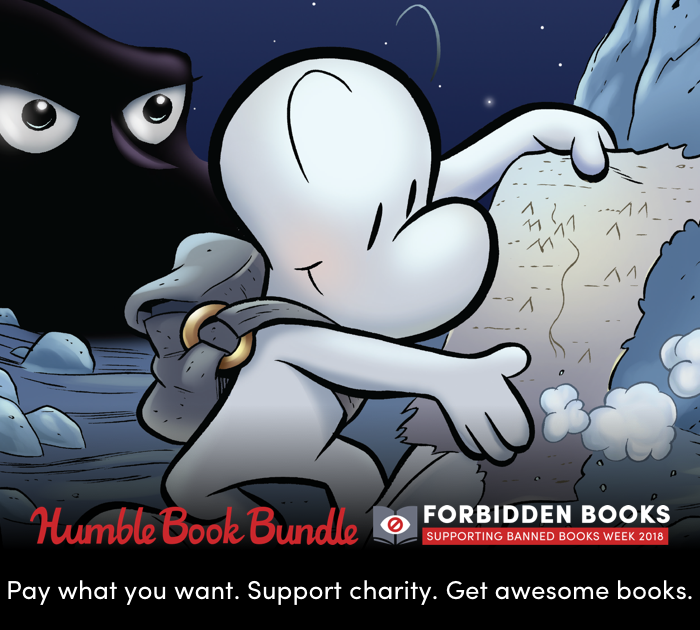 Forbidden Books Humble Bundle Benefits Banned Books Week & CBLDF! San Francisco, CA – September 19, 2018 – From The Color Purple to Saga, Lauren Myracle to Neil Gaiman, even kids classics from And Tango Makes Three to Bone, some of the most popular books in the world are targets for censorship. Humble’s Forbidden Books Bundle fights censorship and helps you celebrate the freedom to read by providing an incredible library of banned and challenged books to benefit the Banned Books Week efforts of the National Coalition Against Censorship (NCAC) and the Comic Book Legal Defense Fund (CBLDF). The Humble Book Bundle: Forbidden Books supporting Banned Books Week 2018 will run from September 19 through October 3 at 11 a.m. Pacific time. Proceeds from this bundle benefit the work of the National Coalition Against Censorship and Comic Book Legal Defense Fund, partners in the Banned Books Week Coalition and Kids’ Right to Read Project. Together, the NCAC and CBLDF help respond to bans and challenges of books with expert advice, letters of support, and legal expertise. They also collaborate to produce valuable resources to protect Free Expression, such as Be Heard!, a free comic book to protect student rights released earlier this year. NCAC’s mission is to promote freedom of thought, inquiry and expression and oppose censorship in all its forms. The Coalition formed in response to the 1973 Supreme Court decision in Miller v. California, which narrowed First Amendment protections for sexual expression and opened the door to obscenity prosecutions. Over 40 years, as an alliance of more than 50 national non-profits, including literary, artistic, religious, educational, professional, labor, and civil liberties groups, we have engaged in direct advocacy and education to support First Amendment principles. NCAC is unique in that we are national in scope, but often local in our approach. We work with community members to resolve censorship controversies without the need for litigation. For more info, check out ncac.org.